in the past it was a custom and honor to receive a doctor’s bag from a respected senior physician. I was given two, one from my father-in-law and his predecessor in the Monroe Clinic in Monroe Wisconsin. Before that I had a hand-tooled bag made by my youngest brother that I used throughout medical school and most of my residency.The doctor bags carried medicines, stethoscope, otoscope, reflex hammer, syringes and so forth. Those bags were given to the Monroe Clinic to their great delight—they had a small party and took pictures. My bag was less durable but also contained several reference books including the Washington Manual and a small coin purse for bus fare and the occasional lunch. I still carry a small bag with my tools in it–a miniature backpack but now I need stampers with all the numbers I must have to write prescriptions. The reference books have been replaced with my phone that contains Epocrates. Much of my social life now seems to revolve around doctor waiting rooms. I am supposed to take my medications in with me. Most people use a plastic shopping bag from a grocery store or Walmart. 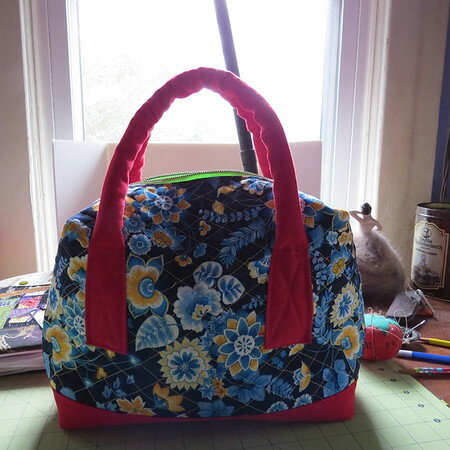 But I decided I wanted something a bit more elegant and so I sewed the above featured bag. It was all leftover stuff from another project so the only ‘new’ thing is the thread–and then my time.